The most important difference between AutoRev and all of the places where you can donate, sell, junk, or auction your vehicle, is that we pay top dollar. 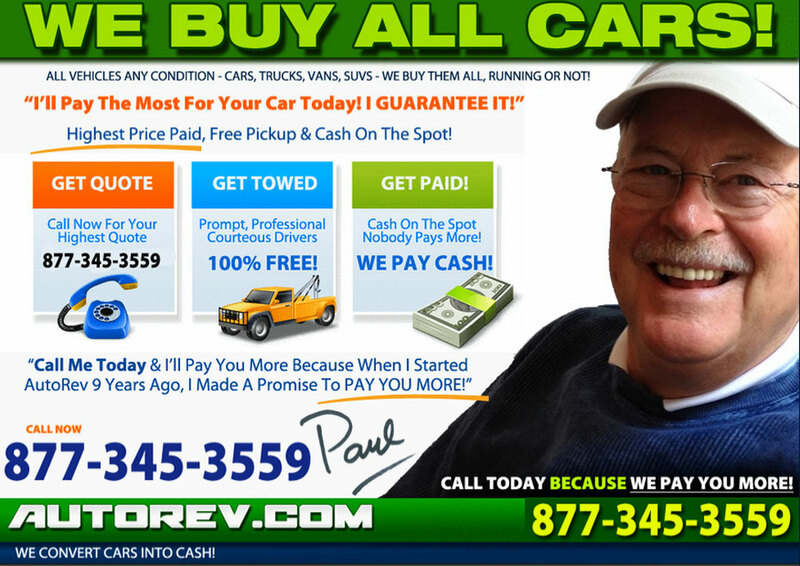 We encourage you to check the yellow pages, scour the web, and call the local guy advertising cash for cars on cable. When you're done getting bids, call us. There are a few reasons why we can offer more than virtually every other vehicle recycling or removal business. First, our national reach allows us to take a different view. For example, while there may be very little demand for late 90's Buick parts in Atlanta, there is a huge demand in the retirement areas of South Florida. Our national perspective means more money for your vehicle. Second, we aren't tied into any specific method of turning your car or truck into cash. Most car removal companies are tied to the local scrap yard, auto auction, or used parts dealers that run them. Whether we sell a car at auction, recycle it, break it down for spare parts, or fix it up for resale, is determined by an assessment of how we can get the most money for your vehicle. Besides offering the most money for your vehicle, we have also worked long and hard to provide strong customer service. We've staffed our call center with American operators that are well trained and well paid. This limits turnover and additional training costs, but more importantly, it ensures that our clients get polite and knowledgeable operators every time they call. We're also dedicated ensuring that the people who show up at your home or business to remove your vehicle are on-time, courteous, and come bearing a certified check for exactly what we offered for your vehicle. We pick our partners around the country carefully. When one doesn't keep their word and service our client's right, we'll find another. Doing our job right means; offering the most for your vehicle, showing up on time to pick it up, and earning your return business for our efforts. Satisfied customers, and the word of mouth marketing they have provided, are one of the main reasons that we have been able to grow our business. We continue to work hard to earn this most valuable of commodities. More than anything else, this makes us different.